The Overmarine Group is proud to announce the launch of the first unit of the brand new Mangusta 110 model which took place earlier this week, on Tuesday 26 November at the companies private wharf in Viareggio. 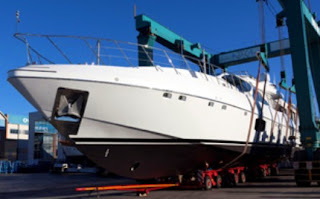 The yacht will shortly be leaving for the United States and glamorous Miami, where she will be presented as a world première during the Boat Show in February 2014. Designed by Stefano Righini in collaboration with the Overmarine Group team, Mangusta 110 is highly versatile yacht and a perfect combination of sport and timeless lines. Without giving up the traditional racy profile of Mangusta models, this new yacht features external areas both fore and aft which are difficult to find on today’s market, and a more than generously sized sport bridge, which can also house a second helm station. The interior layout is the result of careful study of volume, the aim of which was to ensure maximum on-board comfort, excellent and total separation between the guest and crew areas. The layout has means to have a four cabins plan which can accommodate up to nine guests. However, as with all Mangusta yachts, the Overmarine Group Design Department is able to offer different kinds of interior layouts and style solutions and personalised decor in order to fully satisfy the taste and wishes of any owner. The main deck features a large salon which can easily be converted into a lunch space. The crew area, where there is the galley, features all necessary comforts, and has high technical characteristics compated to yachts of the same size. Two MTU 2600hp engines and Kamewa waterjets propulsion give the Mangusta 110 a top speed of 33 knots whilst ensuring excellent stability, a complete absence of vibration and extremely low noise levels. The Overmarine Mangusta 110 also features zero speed gyroscopic stabilizers, which work both at anchor and underway.